TAMPA, Fla. – The University of Tampa women’s soccer team found the back of the net three times in the first half and once in the second to blitz past Florida National University. 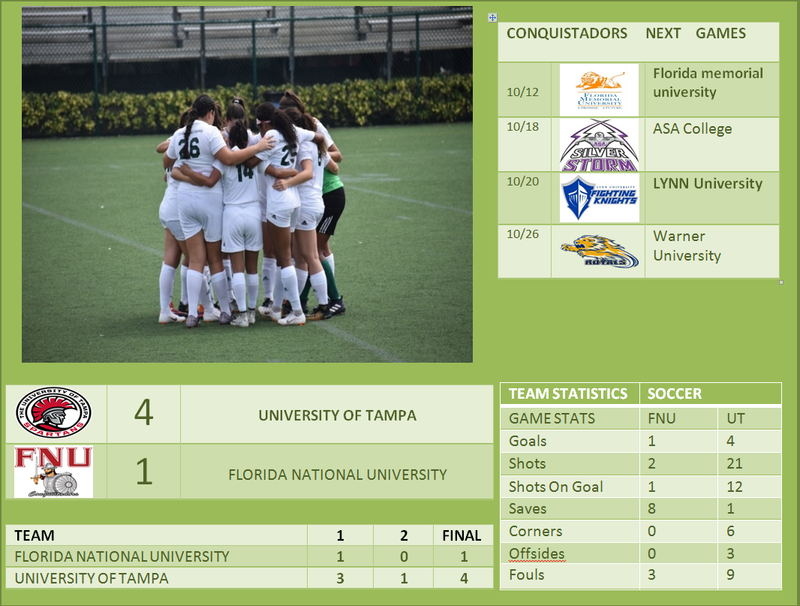 Final: Tampa 4, Florida National University 1. Records: University of Tampa Spartans (4-2-3) vs. Florida National (1-9). All-time Series: This match was the first ever meeting between the two programs. Tampa now leads the series 1-0. 1st Half | Tampa nearly got off to the perfect start as Moeko Morse trickled a shot wide inside the first 60 seconds of the match. Emily Cady won a header 12 yards from goal and found Morse at the back post, but the freshman forward was unable to put the shot away. However, it did not take much longer for the Spartans to find the back of the net. Tampa would take the lead as Libby Wissman scored her first collegiate goal as a Spartan. Wissman lofted a shot into the far corner over the outstretched arms of Florida National goalkeeper Briana Gomez to break the deadlock in the 11th minute. Tampa would double its lead in the 23rd minute as Nastasia Asgedom fizzed a shot into the bottom corner from the edge of the penalty area. Cady would make it 3-0 off a brilliant solo effort. The Florida Atlantic transfer picked up the ball 30 yards from goal, slipped past three defenders and slid the ball underneath the goalkeeper for her fifth goal of the season. The Conquistadors managed to pull a goal back on the stroke of halftime. Natasha Merangolis got her head on a Isabela Martins‘ free kick and put the ball past Megan Bromwell with just 30 seconds to play in the half. 2nd Half | The Spartans nearly regained their three-goal lead in the 52nd minute as Camryn Johnson scored from close range off a Syd Griner cross, but the goal was waved off for offsides. Gabby Desautels would notch Tampa’s fourth goal of the match in 64th minute, heading an Ashley Loeza cross into the net for her first career goal. Lisa Caprara almost made it 5-1 in the 68th minute, evading two defenders and firing a shot off the crossbar. The game was cut short due to lightning. Isabela Martins assisted Natasha on FNU goal. Briana Gomez had 8 saves. UP NEXT: The Conquistadors will return to Hialeah and will have two weeks to get ready for the next game against Florida Memorial University on October 10th at 2:00 pm.